The parts of initiatory Teaching dedicated to the ‘Science of the Rays’ and to the exposition of the natural and cosmic ‘Laws’ will gain more value up to becoming a necessary instrument of reference, with the investigation of the esoteric studies in the whole and useful to understand the Work of the Masters of the Hierarchy that act on each of these seven energetic channels. The parts of initiatory Teaching dedicated to the "Science of the Rays" and to the exposition of the natural and cosmic "Laws" will gain more value up to becoming a necessary instrument of reference, with the investigation of the esoteric studies in the whole and useful to understand the Work of the Masters of the Hierarchy that act on each of these seven energetic channels. The ancient initiatory Tradition considers the seven Rays as seven cosmic Entities; through their awareness, adaptability and intelligent activity the Divine Plan is carried out. These seven cosmic Entities are expressed through seven physical instruments which are the seven planetary Logos. For this reason the seven planetary Logos are called "sacred" or "holy". The seven Rays embody the Divine Proposition and Will, they express the required energetic qualities to materialize it and create the forms through which the Divine Idea can be accomplished. Through the seven Rays the Aspect life or Spirit cyclically flows through all the Kingdoms of Nature, determining all the states of conscience in every field of consciousness. The manifestation of any human being moves in the wave of the impulse of one of the Rays, and it is characterized by those qualities that determine its form aspect. The Ray is the path to follow; once reached the third Initiation it allows to perceive the proposition of its Ray and to cooperate with it. After the third Initiation man, now aware of his subtle essence, starts perceiving his own synthetic proposition to which all the Rays cooperate. The human Soul is a synthesis of material energy qualified by the intelligent conscience of a Ray plus the spiritual energy also qualified by one of the seven Rays. Each of the other planes as well, viz. physical, ethereal, astral and mental, are characterized by the energy of a Ray that is not necessarily equal. Each Kingdom of Nature as well reacts to the energy of a specific Life of Ray. All matter pulses, resounds and has a color. Every human being is made to emit a specific sound that lights a color when emitted. The combination of the two vibrations indicates a certain frequency that is its characteristic. Each of us belongs to a Ray, therefore we all have a predominant color and emit a certain sound. Among his material vehicles, man has the ethereal Body that attracts and joins the different elements of nature that make the physical body. These elements are drawn from the mineral, vegetal and animal Kingdom. The structure of the skeleton comes from the mineral world; liquids, lymphatic and blood systems from the vegetal world and the organs of the physical body from the animal kingdom; finally we have all the gases that form through the activity of each of those structures. The ethereal body is made of a fabric of energetic threads; such energy threads are focused in the seven energetic centers or Chakra, through which the Soul rules its own manifestation on the physical plane. We also must consider the seven senses: hearing, touch, sight, taste, smell, intellect and intuition, which are the physical correspondent of the seven Rays. Each Ray is related to the emission of a certain sound and to the emanation of a certain color. According to the traditional Teaching each of the seven Rays has created its own body of expression and this originated the so-called seven "sacred" planets, which manifest physically their activity in the whole solar system. Besides the Sun the planets are: Jupiter, Saturn, Mercury, Venus, Mars and the Moon. The planet Earth, like others, hasn't reached consecration yet. It is working to achieve it under the influence of Venus, the planet of Mind. The seven Rays are divided into three greater or synthesis Rays: 1st, 2nd and 3rd and four lesser or attribute Rays: 4th, 5th, 6th and 7th. The Mineral world belongs to the first Kingdom of Nature and embodies the 7th Ray. The three great Rays of synthesis (1st, 2nd and 3rd Ray) make up the whole of Divine manifestation. These three greater Rays all together express the manifested Divinity, the embodied Word, the expression of creative Proposition and the Synthesis of life in quality and appearance. They are active in every form and in every Kingdom and they determine the wide general characteristics that rule energy, the quality of the five Kingdoms of Nature, included the spiritual one, the fifth, which undergoes the action of Will and Power. Through the Rays differentiated forms take place, specialized lives are expressed and the several divine agents carry out their work in the plane of existence assigned to them. Along these three currents of force of qualified life the creative means of God make themselves heard powerfully. The interaction of these Rays determines the external phenomenal appearance. 1st Ray: Will and Power. It is a Ray of such dynamic intensity (dynamic electrification) that it is called the Destructive Ray. The key to understand the first Ray is in the radium. Its highest power can be found in the mineral Kingdom. In this Ray the dynamic Idea of God is embodied. The work of what in the West is called Christic Principle is to build the forms for the expression of the Divine quality of life. This is the characteristic of the second Aspect of Divinity. Whilst the work of the first Aspect of Divinity is to destroy forms. Nevertheless the work of the Destroyer is not negative, like the ignorant humankind mistakenly believes. Its work is liberating, it proceeds towards the "metamorphosis" and the "transmutation" of every form of energy. It is the interlude to "Renovation", which is as much beneficial as building the forms, and it is only the deep aversion of man to the death of his animal form, with which he identifies, that makes him consider the work of the Destroyer as unfortunate and opposite to the Love of God and to the will of his Divine Plan. Both the work of the Builder men and that of the Destroyers is driven by the high spiritual Planes and it usually occurs in unison. The symbols of these two different ways of operating are the sword for the Destroyer and the cross for the Builder. Talking about other characteristics of the first Ray, we will say that its Word is Power and its light is electric, so much so that its symbol is the lightning (see the thunderbolts that Jove holds in his hand as a sign of his Power). This Ray is not in full expression yet but when it ends the physical cycles. The proposition of the first Ray is to free energies allowing their progress through metamorphosis. This is made possible by cyclically ending the material forms that imprison them. This is the sense of physical death. Furthermore this Ray acts on the fourth Kingdom of Nature, the Human world, because it is also the Ray of the "Initiatory Journey" in every Order and Degree (see White Freemasonry). Astrologically its planet is the Sun and its day Sunday. The qualities that fall under the first Ray are: clear-vision, dynamic power, sense of time, solitude, detachment and uniqueness of proposition. The Plane of this Ray is that of Divinity. On the human plane its higher expression is the science of government and in the West, the esoteric work of Freemasonry; whilst the lower one is diplomacy and politics. The related sense is touch. The esoteric color is red, the exoteric one is orange. The corresponding Center is the head. The characteristic virtues of the man of First Ray are strength, courage, resoluteness, sincerity, absence of fear, ability to govern, open-mindedness and the management of men and means. His possible faults are pride, ambition, stubbornness, arrogance, hardness of feelings, desire for supremacy, obstinacy and anger. The virtues to be acquired are tenderness, humbleness, sympathy, tolerance and patience. It is particularly active in the vegetal Kingdom where it produces the magnetic activity of flowers. Its mystery is enclosed in the meaning of their smell because, like flowers, desire too is expressed with attraction and the ability to attract to itself (magnetic electrification) what is the object of its desire or what is considered necessary. The second Ray is essentially love (Law of magnetic attraction); it is the force of cohesion and the principle of magnetic cohesion to which undergoes every creative work that produces the coming to light of the manifestation of forms and appearances, through which it is possible to satisfy the loving desire. The second Ray is the Ray of Divinity itself and it is characterized by the particular Aspects of desire and love. It deals with the first formulations of the plane, according to which the Form will have to be built (Divine intention) and the Idea materialized (the Divine project). In this way Designs with mathematical precision and geometric perfection in their structural unity are originated. Here comes the term "Great Architect of the Universe" that makes possible the Work of the Great Builders (the seven Rays are the Great Builders). As John wrote, the Temple will be erected on the basis of figures and forms, numbers and sequences, including and expressing the glory of God. The second Ray is that of the Masters of Compassion, Love and Wisdom; the Great Instructors of the Humankind such as Buddha and Christ. Astrologically its planet is Jupiter and its day is Thursday. The second Ray is the actual dominating Ray in the whole solar system, included our planet. Therefore its actual influence is important in the evolution of the humankind. The qualities subjected to the second Ray are: Divine love, radiance, attraction, power of salvation, wisdom, expansion and inclusiveness. Its Plane is that of the Monad. On the human plane its higher expression is the process of Initiation, whilst the lower expressions are national religions. Its related sense is intuition. Its esoteric color is blue, whilst the exoteric ones are indigo and purple. The correspondent Center is the Cardiac one. The characteristic virtues of the man of Second Ray are calmness, inner strength, patience and endurance, love for the truth, loyalty, intuition, clear intelligence and serenity. His possible faults are giving too much importance to theoretical study, coldness, indifference towards the others, and disdain for other people's mental limits. The virtues to be acquired are love, compassion and altruism. 3rd Ray: Intelligent activity and Adaptability. The 3rd Ray is the aggregation of active constructing forces (electrification by diffusion). It is the Great Architect with His Builders who organizes the materials, starts the work and, with the progress of the evolutionary cycle, materializes the idea and the Divine proposition under the guide of the 2nd Ray (Christic Principle). Humanly it is the Ray of the abstract thinker and excellent philosopher. The 3rd Ray had a very long cycle of activity in the solar system ruled by Saturn with a direct effect on the 5th Race, viz. the Arian race, whose material and Saturnine Divinity is Yahweh (Jehovah). This Ray is particularly connected to the animal Kingdom and it produces the tendency to intelligent activity that we can see in superior animals. The Builders that work under this Ray (the biblical Elohims) produced the individualization of the animal-man letting him out of the unconsciousness of the animal herd which he was subjected to (the permanence of the state of insensitivity and unconsciousness of the animal status is seen nowadays as a time of "paradisiacal" happiness on earth). For man and woman it was the end of the peaceful animal irresponsibility and the start of individual responsibility. It was the start of the earthly journey that would lead them with pain and struggle to physical existential self-conscience first, then to psychic self-conscience and finally to a spiritual one. In this key we must read the so-called "expulsion from the Garden of Eden" mentioned in Genesis. It is when Adam and Eve, symbol of the new Arian Race, as the Genesis narrates, from their ethereal consistency were "clothed in animal skins", viz. they were given a physical body to start their evolutionary journey on Earth. In my conversations I always use the example of the "expulsion" of the bird from the nest where it lived, fed and protected by adults (which for man where the Elohims). But for "every young" comes the time to grow and learn to fly. This could be a good allegory, especially for its positive educative sense, to understand the so-called "expulsion" of man by Chronos-Saturn, Yahweh, the Master of the 3rd Ray which later other devotees in the West called the Holy Spirit. Astrologically its planet is Saturn (indeed Yahweh) and its day is Saturday (Sabbath is the day that Hebrews dedicate to their God). The qualities under the 3rd Ray are the power to manifest, the power to evolve, mental illumination, power to synthesize on the physical plane scientific enquiry and ability of justice and balance. Its Plane is the plane of Spirit. On the human plane its higher expression is the use of communication and its means, used to restore the Principles of Human rights and Divine Principle. The lower expression is the use and spreading of money, politics of economic and financial power. The related sense is sight. The esoteric color is green and the exoteric one is black. The corresponding center is the throat. The characteristic virtues of the man of 3rd Ray are open-mindedness, ability for abstraction, sincerity of propositions, clear intellect, ability for concentration, patience, cautiousness and at the same time lack of worry. His possible faults are intellectual pride, coldness in feelings, tendency to isolation, inattentiveness to details, tendency to be absent-minded, obstinacy, egoism and criticism. The virtues to be acquired are sympathy, tolerance, devotion to an abstract ideal, accuracy and common sense. The three greater Rays act on the creative process, whilst the work of the four lesser Rays is to elaborate and differentiate the qualities of life. The three greater Rays produce appearance, confer quality and through the Principle of life that is the aspect subjected to the Divine Unity, they guarantee continuity of growth until the Divine will is affirmed as Power and has attracted to itself all that it desires, has used the experience of a growing harmony and applied with intelligence the result of experience to produce more sensitive and harmonious forms that are better suited to express the qualities of Divine life. The color of synthesis of the three greater Rays is indigo and each of these Rays is dual in time and space. In their temporary duality in each of them can be found the reciprocal action that we call Law of Cause and Effect. The first Ray is the Will Aspect which, dynamically applied, is manifested as Power; the second Ray is the Love Aspect working in a magnetic way that manifests itself as Wisdom; the third Ray is the Intelligence Aspect which exists in power in every substance and causes their activity. We can see the effect of their interaction in the activity of the four lesser Rays called subsidiary or attribute. 4th Ray: reaching Harmony by overcoming Conflicts. Justice and Balance, Harmony, Beauty and Art. 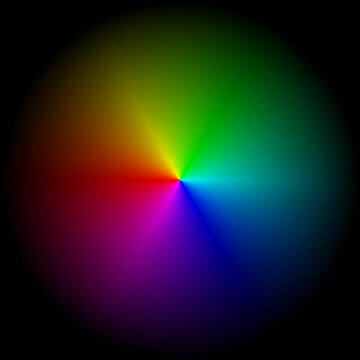 This Ray embodies the Principle of Harmony (electrification by harmony) therefore the fourth Ray gives every form all that produces beauty from harmony. This Principle actively works to harmonize all the emanating effects from the world of causes, the Archetypes made by the influence of the three greater Rays. Harmony is reached only after overcoming every conflict that arises in the contact between creative and intelligent will and the Chaos of the primordial matter (energy). To simplify this concept imagine the resistance of a block of clay to the hands of the artist who wants to shape a harmonious form formulated by his creative and intelligent thought. From the creating of such a preciously graceful form you will get the idea of the harmony principle that originates from the conflict with the obtuse density of the material world. This Ray will enter its full manifestation in 2025. The Ray of Beauty and Harmony brings organization to the form. It is the Ray of exactness rather than the Ray of the artist. Essentially it refines and leads to the search for perfection in any kind of form, especially the forms of thought. This is the Ray that uses the Divine energy to erect in Nature the celestial Temple that will contain its Light. The Fourth is also the Ray of color. Astrologically its planet is Mercury and its day is Wednesday. The qualities of the fourth Ray are the descent in the matter, the double aspect of desire, the power to reveal the Path, the power to express Divinity, Growth, harmony of spheres and the synthesis of true beauty. Its plane is Intuition. On the human plane its higher expression is the exoteric Work of Freemasonry, viz. the search for Justice and Morale. Its lower expressions are architectonic constructions. The related sense is smell. The esoteric color is yellow and the exoteric one is cream. The corresponding center is at the basis of the backbone. The characteristic virtues of the man of fourth Ray are tenacious affection, sympathy, physical courage, generosity and devotion, agility of intellect and perception, refinement in taste and elegance in attitude and the search for beauty. The possible faults are egocentrism, apprehension, negligence, lack of moral courage, violent passion, indolence and extravagance. The virtues to be acquired are serenity, self-confidence, self-control, pureness of intentions, altruism, exactness and mental and moral balance. 5th Ray: Concrete Knowledge and Science. The fifth Ray determined what we call science (electrification by crystallization). The true scientist, viz. the man who isn't subjected to the interests of negative powers, is a coordinated personality and works on higher mental levels, therefore he is closer to the Ego than the ordinary man; his action is more unifying than others. To explain the concept we will take the religious man as a comparison. He is mostly astral and emotional (the 6th Ray in its less advanced interpretation) therefore, on the contrary of a scientist, a religious man acts with a separating and sometimes sectarian attitude (I am the true believer, you are not). Indeed, whilst scientists tend to unify their scientific attributes, making science a more and more universal principle, religious men with astral tendencies (basically all of them) tend to diversify their interpretations of faith on the Divine Unity, turning their beliefs into a separating result of popular culture and national ideology, which usually brings the parts involved in conflict. National religions undergo an ideological attribute that tends to separate by pretending tolerance, or more often indifference, or to unjustifiably prevail on others (religious egotism). This attitude doesn't lead back to the principle of unification, even less to universality, therefore those religions are called "exoteric". This Ray is initiatorily said the "Revelatory of the Path" Ray. Descending, this Path leads to the world of matter and involves the invisible but true reasons of the cycles of death and incarnation, whilst ascending it leads from darkness to the pure light of the Divine Day. Astrologically its planet is Venus and its day Friday. The qualities subjected to the 5th Ray are the ability to penetrate every form; the power to make the Voice of Silence heard, initiating activity, revelation of the path, purification with fire (animic or spiritual), manifestation of the great white Light. Its Plane is the mental one. In the world of man its higher expression is esoteric psychology, whilst the lower expression is materialistic science, theory and speculation of the lower reason. The related sense is the lower intellect (the higher intellect is the thought of the Soul). The esoteric color is indigo whilst the exoteric one is yellow. The corresponding Center is at the center of the forehead. The characteristic virtues of the man of the 5th Ray are precision in statements, perseverance, common sense, rectitude, independence, intellectual sagacity. The possible faults are ruthless criticism, narrow-mindedness, arrogance, difficulty to forgive, lack of sympathy and discretion and prejudice. The virtues to be acquired are reverence, devotion, sympathy, love or tenderness of feelings and an open mind. 6th Ray: Devotion and Idealism. This Ray has not been in manifestation for over 200 years but its most undesirable effects haven't faded yet; in absence of the influence of the 5th Ray they have produced for a very long time the exasperated conflict of nationalisms, faiths, popular cultures and ideologies. A "devotion lacking intelligence" has marked the most obscure period of mankind (the Vulgar Era) but its results are not all rotten yet and they still seem to be appealing to many human organizations among the most sectarian and egocentric (such as armies and many esoteric churches). The 6th Ray embodies the principle of recognition of ideal reality (electrified fluid forms). But the principle of ideal reality (Archetype) ends up undergoing the imperfect form that should express it. Despite the imperfection of the form that should express ideal, event, action, writing or word, the lower mind of man determines the highest imperfection. For this reason the last manifestation of the 6th Ray has been imperfect and for some situations even undesirable. The minds that should have manifested their Ideals didn't advance enough and they grasped them only partially, translating them into facts full of egocentric absolutism. The history of the infinite genocide perpetrated by western political-religious nationalisms is the most recent and best example of the worst use that has been made of the 6th Ray. But the mistake, even tragic, is the unavoidable price for human progress. To affirm an ideal implies the concentrated application of desire and intelligence, as to effectively express the idea conceived through a perceivable, audible, tangible or visible form. To the 6th Ray is due the formulation of most of the ideas that have driven the humankind so far. Furthermore during the cyclical manifestations of this Ray occurs with more and more effectiveness the distinction between appearance and quality, work that enfolds all on the astral plane. Astrologically its planet is Mars and its day Tuesday. The qualities that undergo the 6th Ray are the power to kill desire; the disdainful refusal of what is not wanted, self-immolation and self-sacrifice (but often out of place), endurance and emotional daring, ability for detachment, domain on the waters of the astral nature. Its plane is the astral one. In the world of man its higher expression is the differentiation of ideals up to the point of recognizing their matrix, common to the whole humankind. Its lower expression is devotion to "one's own idea" or to a "physical person" that it sees as the Maximum Leader of its cult (the cult of personality and idolatry are the symptoms of an involute devotion); but also to join associations organized as political institutions, armies, churches and exoteric religions. They are all examples of an involute idealism refractory to the Principle of universality. The related sense is taste. The esoteric color is silvery pink whilst the exoteric color is red. The corresponding Center is the solar plexus. The characteristic virtues of the man of the 6th Ray are devotion and loyalty to the fixed goal, loving sensitivity and tenderness, inspiration, loyalty and reverence. The possible faults are egoistic, jealous and violent love, excessive relying on others, partiality, self-deceit, sectarianism and extremism, superstition, prejudice and preconception, rushed conclusions, anger and aggressive fury. The virtues to be acquired are the ability to abstract from one's own astral world (dreams and illusions), to reach purity and universality of the Ideal super partes, strength and self-sacrifice, but only if justified by facts, purity, sincerity, tolerance, inner serenity, balance and common sense, altruistic love. 7th Ray: Ceremonial and Ritual Order. The seventh Ray carries out its work mainly on the ethereal planes of the physical energy (electrified physical forms). It is the true Magic Work in White. When the 4th and 7th Ray will embody together there will be a particular period of Revelation and Illumination. In the west it will be the great moment for Freemasonry in a spiritual sense. The Lost Word that it hides in its Mysteries will be given back and pronounced so everybody will hear it. The Master will appear and will walk among his constructors in the full light of glory that irradiates from the East. All the gates will open wide and the human conscience will respond to all the divine manifestations (see White Freemasonry of the 3rd Millennium). For the effect of the 7th Ray the brotherhood of the Freemasons, initiated Masons but not "Initiates" yet, will enter a new initiatory Era with distinguished spiritual activity. It will start approaching its true function and the accomplishment of the destiny planned for a long time for the Master Builders and the Initiates of the humankind. The Power and effect of the Ceremonial Work, which is now carried out in the Lodges only symbolically, will be demonstrated. It will be understood that the true sense of the initiatory Work and the use of Words of Power is hidden in the "rhythmic" regularity and the motor and sonorous cyclicity (vortexes and energetic precipitations) consecrated by the Ceremonial (I am intentionally using a language clear only to some Adepts, but these indications should stimulate the intuition of many outsiders, who might draw from these words a certain conclusion very important for them). The next Era of Group Work and Power, of synthetic and ritually organized Ceremonial activity will deeply affect Freemasons; gradually the importance of a central and dominating figure will disappear together with the influence of the 6th Ray and the true subtle Work of Freemasonry on the world of astral forms will be finally revealed. The Masonic Work symbolizes the Ritual Order of the Universe. The Work of spiritualization of the forms can be considered the main activity of the 7th Ray and this activity is not relative only to the initiatory field, but the process of alignment, coordination, integration, fusion and amalgamation among several levels of the inner reality of man is active on ethereal levels every time that a part of a Soul is embodied (only the physical conscience) and a child is born on earth. The 7th Ray hides the secret of physical color and sound but it is also the Ray of Law, with its Cadences, Cycles and Rhythms. It is the Ray of the Ceremonial therefore of the Initiator and Great Priest. The advanced man of this Ray has the most intense relationships with the Brothers of the 2nd and 5th Rays. Astrologically its planet is the Moon and its day is Monday. The qualities under the 7th Ray are faculty to create, to cooperate and to think, revelation of the beauty of God, mental power and vivifying power. Its Plane is the physical one. In the world of man the higher expression is White Magic. But the White Magic referred to in the 7th Ray is not associable with any type of magic concept or magicism of any nature or current, even the most mysterial one. It is absolutely unknown because it is used by Members of the White Brotherhood from the third Initiation up; therefore profanely it can't be judged. Its lower expression is the spiritualism of theurgic phenomena (see the meaning of ordinary Theurgy and spiritual Theurgy). The related sense is hearing. The esoteric color is purple, whilst the exoteric one is white. The corresponding center is the sacral center. The characteristic virtues of the man of 7th Ray are strength and perseverance; courage, courtesy, great accuracy in details, sense of rhythm and sense of time, self-confidence. The possible faults are formalism and conformism, bigotry, pride, narrow-mindedness and superficiality in judgment, excessive presumption and indulgence towards himself. The virtues to be acquired are the realization of unity, open-mindedness, tolerance, humbleness, kindness and altruistic love. What determines the mental structure of man are the influence of the egoic Ray and the Ray of Personality. They act on his material conscience penetrating into its formal mechanism through the unities of energy of which it is made of. Other influences that work on him are cosmic, solar or astrological and environmental Factors. 1) the Ray of the solar system (the previous one was the status of 3 rd Ray, the present one belongs to the 2nd Ray and the next will belong to the 1st Ray). 7) the Ray of the Soul or egoic Ray. The egoic Ray, or Ray of the Soul, in the planes below acts on the physical mind and on the body making them more sensitive and efficient. With individual progress the egoic Ray prevails on the Personality Ray, which acts "alone" on the astral Body. After the 3rd Initiation the Egos of 4th, 5th, 6th and 7th Ray will join one of the three greater Rays which the Monad belongs to. 8) the Ray of Personality. Psychosomatic diseases arise in the man's body and mind when Personality is in autonomist and centralist conflict with the egoic Ray. 11) the Ray of the physical Body ruled by the 3rd or 7th Ray. In each Cycle (Era) the Rays rule in the number of five at the time (Law of Cycles). All the Rays manifest their influence but only five are predominant. The 1st and 2nd Rays are mainly the goal of the human effort, whilst the 3rd is the goal of angelical evolution (Angel in the East is called Deva, whilst an Archangel is a Builder Deva). The disappearance of a Ray implies the "definitive extinction of a particular form". We must remember that not only the concrete ones are forms; form-thoughts and forms of expression must be counted among the forms that appear and disappear cyclically. An artistic or architectonic movement, a current of thought, a certain way of observing the world, an ideological creed, a faith or a culture are all forms that undergo the Cyclic Law and the influence of Rays that intervene on the conscious mind of man coloring his emotions and as a consequence influencing every form he produces with his thought. This happens until the "adult age", viz. up to the complete self-conscious individualization of man in the true Self. The 1st , 4th and 5th Rays determine the mental body in man, the 2nd and 6th his astral body and the 3 rd and 7th his physical body. The 1st , 3rd and 7th Rays are connected to the form. They influence the evolution of concrete forms of the matter and form from the lowest to the highest level (every plane, such as the ethereal-physical, astral, mental, etc... is made of 7 levels of "density"). Whilst the 2nd, 4th and 6th are connected to the (inner) life that expands in the forms. They are the Rays of motive, aspiration and sacrifice; they express quality and act on the spiritual expression developed in the form. The 5th Ray is a central point of the achievement of the lower planes of the mind from the Ego. It becomes the home of the Ego once it is embodied in the physical mental plane. At that moment the 5th Ray becomes a point of connection with the integrated Personality and the reflection in the three worlds of the Monad. The 5th Ray develops intuitiveness and it is the link of conjunction between lower and higher intellect. The higher intellect is the access to intuitive vision. Intuitive vision is a form of vertical telepathy. The Rays with correspondences among them are: 3rd and 5th / 2nd and 6th / 1st and 7th; the only Ray without any correspondence with others is the 4th. Except for cases such as a Great spiritual Guide, there isn't a human being who expresses with purity the quality of a Ray. The reason is that nobody has yet reached such an advanced physical form and a mental structure to express the perfect intensity of a quality of Ray. A Ray gives particular physical conditions, determines a quality of the emotional nature, characterizes a particular virtue of the mental body and finally rules the chakra through which its energy is re-distributed in the planes of man. Therefore each Ray rules a chakra and when it is activated by reacting to the development of human conscience, it enriches man with its energy. As we have already mentioned, the Rays are cosmic Entities that manifest themselves cyclically. In order to explain this statement, here are some examples of cycles of manifestation: a) a solar cycle, such as the present one, where the 2nd Ray rules and makes all the others subsidiary; b) a planetary cycle where each Ray, Intelligent Cosmic Entity, embodies in a race whose people will believe that it is their God revealed (see the Entities that used to work through Saturn for Hebrews and through Jove for Greeks, which were their physical divinities. Christ as well is a cosmic Entity, appeared in the Age of Pisces, who will re-appear in the Age of Aquarius); c) the cycles connected to the signs of the Zodiac and the cycles of activity determined by their numerical symbols. The twelve-months Zodiac is an illusion, because in it "we can see" the signs pass by from far away, but they don't physically "transit"; therefore this Zodiac is only an academic concept. The signs of the "seasonal" Zodiac are only fictitious and its study is only academic. The Zodiac signs are the symbolic division of the cycles of a small round that lasts about 25,000 years and a big round that lasts 250,000, where we "cross" the twelve signs that manifest themselves every 2,100 years circa (for example: during the first years of the 70s we entered the sign of Aquarius, where we will remain for over 2,000 years; these 2,000 years and more are the Age of Aquarius. This is it. Where is the "seasonal" influence of the other signs, then, except in the popular imagination? ); d) the cycles of entry and exit from manifestation (appearance and disappearance of a Universe). It is said symbolically that the Humankind is the Great Treasurer of God. This is the Royal Secret of Freemasonry that is revealed to its rare Initiates. We will only give a short indication in an allegorical form: in the Human Kingdom they flower together with the three Divine qualities. In man, Holy Spirit God instilled the mystery of manifestation. The man of the 5th Kingdom (from the 3rd Initiation on) will reveal in the whole the Nature of Divinity and eternal life.